It was the year 1987, I was a sophomore in high school and I had already been playing drums for six years. My main influence at the time was Alex Van Halen and I was a big fan of the band. It was also around this time that my friends and I would take long trips to see our high school football team dominate around the state. It was on one of these trips that one of my friends brought along The Doors first album on cassette tape. I was instantly drawn to the sound and particularly the drumming as it could be fast, slow, rocking or even jazzy. Of course, this was way before the days of youTube and the internet so I really had no idea what the band looked like and certainly no idea what drums the drummer used. Fast forward to a few months later and another friend of mine let me borrow the newly released Doors at the Hollywood Bowl that had just come out on VHS. The concert footage was filmed on July 5th 1968 and I had my first glance of the Doors, John Densmore and THAT little orange drumset. In a world of hair bands, massive stages, pyrotechnics, huge double bass drum sets offered in colors like white, black, maroon, etc, it was refreshing to see a drummer on a big stage using such a small set. John Densmore had amazing speed in both hands, creative drum parts and a super clean buzz roll put to full use during the Unknown Soldier complete with Robby Kreiger shooting Jim Morrison execution style with his guitar! I learned several things after watching that video. First of all, I needed to develop my weak hands and wrists so I could execute fills and rolls like John. Second of all, I told myself that I would one day find myself a set of orange Ludwigs as orange has always been my favorite color. At the time I knew next to nothing about vintage Ludwig drums or how rare the color of John’s set was. After graduating high school and beginning my passion for WFL/Ludwig drums, I began my quest to learn as much as I could and hopefully find my own orange set one day. It has been 27 years since I started to actively learn about the history of Ludwig drums, collect the drums of my dreams and play gigs out professionally. I have learned a lot about vintage Ludwigs and lots about John Densmore’s downbeat Ludwig set from many years of research on my own. There has been lots of confusion and mis-information on the set, configuration, the introduction of the color as well as the whereabouts of the set. Hopefully, here I can shed some light, dispel some myths and add a bit of closure to an obsession that started 30 years ago! Mod Orange and Psychedelic red first appeared together or at least very close together around June of 1967 and the beginning of the Summer of Love. Looking back at catalogs and literature from Ludwig would give one the impression that the two colors were offered in early 1968 or even possibly 1970 as the first mention of either color is the spring 1968 edition of the Ludwig Drummer. Ludwig also published a catalog for 1966(released in 1967) that was just before either colors release and the next catalog was printed in 1970 that featured both. The earliest example of a Mod Orange drum that I know of was on a jazzfest that I saw that had a June 1967 date stamp. Both colors were also very prone to fading and it is not uncommon to find examples that lose either purple from Mod Orange or green from Psychedelic Red leaving faded areas of the finish. One reason that John’s Mod Orange set is so rare is the particular sizes that he used. John’s background was primarily jazz and his idol was Elvin Jones. In 1967 smaller size drums were still popular but it was not long before bands got louder with guitar players cranking up Marshall amps, audiences got bigger and PA systems cranked out more power than ever before. 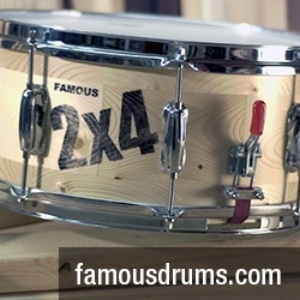 Many drummers started to use larger size drums and by 1970 24” and 26” bass drums were becoming the norm thus making the smaller sized drums out of favor. Ludwig produced the color Mod Orange up until around 1971 and most of the bass drums are at least 22” and up as most floor toms were 16” and up. John stayed true to his jazz roots and used smaller sized drums for much of his time with the Doors. Drummers in those days also primarily played the same gear for years and while it’s true that John had four sets in his time in the Doors, the Mod Orange set was put to use from the first gig in Sept 1967 all the way up until recording the last Doors album L.A. Woman released in April 1971. The set was even used in 1974 when John played it live on the Midnight Special TV show with the Butts band featuring John and Robby. After The Doors first album recorded in August 1966 and released in January 1967 became a hit, The Doors found themselves in high demand touring around the world. By September of 1967 John purchased the Mod Orange set to keep up with the many shows and TV performances that were in the future for the Doors. The White Pearl Gretsch set John had been using was put to use in the studio while the Mod Orange set became his road set. It is not known to me where the set was actually purchased but oddly enough there is a pic of studio great Jim Gordon floating around the internet that was taken at the Professional Drum Shop in Los Angeles some time in 1967. In the background on the shelf is a Psychedelic Red set and what looks to be a small Mod Orange set. It’s possible that this could be John’s set as it is probable that the set was purchased from Professional Drum Shop as The Doors were an L.A. band. The first gig John used the set was Sept 9th 1967 at the Village Theater in NYC as John is pictured behind the set with its original front logo head that John removed and never used again after the show. I have spent many years researching the set and trying to find out the whereabouts of its current location and last year I finally met someone who owns what is thought to be the last surviving piece: The 14” floor tom. I had first heard back in the late 90’s that the Hard Rock had the set on loan from John and while in Vegas in 1998, was excited to learn that the set was there. Much to my disappointment, I discovered that the set on display over a bunch of slot machines was in fact a 1968 Ludwig Mod Orange set in the popular Hollywood configuration of a 22,12,13,16. John’s downbeat 20,12,14 sized set is easy to spot as it has one mounted tom on a rail mount, the 12” tom has small lugs and the 20” bass drum has eight lugs per side as opposed to the ten that would be on a 22” and up. The set also has the popular white paint that Ludwig was using up until the early part of 1968. The story also became confusing as the Hard Rock also owns a 20” Doors logo head that has a repaired rip across the entire head. This drum head is, in fact, a real Doors head as John used it on his Mod Orange set on a 1969 TV appearance called Critique which is available on DVD. What is not shown on the DVD is a rowdy Jim Morrison putting a stick through the entire head joking around with John shown holding his hi-hat stand up in defense. The hard rock set was also displayed at the Petersen Auto Museum with John’s old 1968 Ford truck claiming that this was once again John’s original Doors set. It was not until the mid-2000s that while surfing online I saw a pic of Vince Treanor (Former Doors road manager) pictured with the 14” floor tom that I knew was John’s. It was sometime in early 2016 when I learned that the drum had changed hands and was now in the hands of a new owner. I was able to contact that owner and was happy to find that he was very friendly and even happier when I realized that the drum was not terribly far from me and that I could go see it. Along with the owner, we were able to look at close up pics of John using the drum in the 60s and match up the color striations to authenticate it as the original drum. The drum is as one would expect for a piece of gear that has been all over the country inside and outside, in and out of studios and under the bright lights of TV studios as well as being 50 years old this year. I have a 1968 14x14 mod orange floor tom myself that is in incredible shape and John’s floor tom is quite faded in comparison. For a drum that has seen it all I would not expect any less and if it were to look like mine I would be incredibly suspect that John had ever used it. The drum also has its original white paint that is chipping and there is no bottom head as John often played his drums this way. The keystone badge also has a serial number with the number 490907 which roughly puts the drum around the June/July build timeframe if you follow the serial number dating guides. Unfortunately, there is no date stamp but the drum actually has John’s name neatly etched into the bottom wood ring of the drum. The most remarkable thing about the drum is the drumhead. John never liked to change heads preferring to play heads until they were old and practically barking back at him. The head on this drum is an original 60s Ludwig head and looking at pictures of the wear pattern from the 60’s and the current wear pattern one can see that this is the same head! More than likely classic songs like Touch Me, Roadhouse Blues, Riders on the Storm as well as all the rest of the songs from the last three Doors albums, possibly the two that were recorded after Morrison’s death in 1971 and the Butts band albums all featured this drumhead. Not to mention all the various live performances and it is just astounding that the original head is still there without a rip. Most professional touring drummers change heads every couple of days and some do it every show. I could practically hear the Touch Me intro coming off that drum! Unfortunately the whereabouts of the rest of the set are not known and I fear that they may have been destroyed or lost over the years. Finding the whereabouts of this floor tom and seeing the drum in person finally brings things full circle for me(pun intended) and, after a 30 year of drum obsession, I can finally say that I saw the drum that led me down the path of collecting Ludwig drums. Hopefully, my research and article will help other curious drummers like me know the true history of a drum set that is a true piece of rock and roll legend. December 4 1968: Smothers Brothers Comedy Hour. Kurt Ekstrom is the drummer for the Shana Stack Band and has been playing drums for 36 years. Kurt started collecting and researching vintage Ludwig drums in 1990 and has become an authority on the Ludwig brand. Kurt has also been an active member on drumforum.org since it’s beginning as well as vintagedrumforum.com. Kurt plays Classic maple Ludwigs with his band and endorses Rich Sticks as well and Kelly Shu bass drum microphone systems. Kurt can be reached at judithek@comcast.net.